Bit more done on this Autumn Ent during my lunch break today. 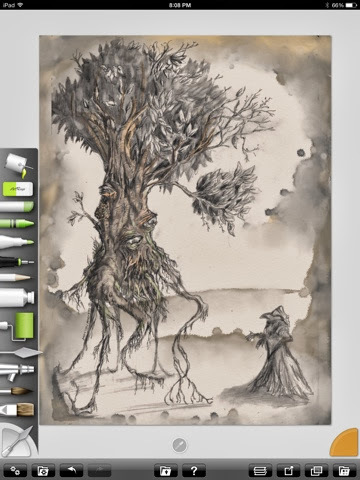 Pencil on Moleskine, painted with ArtRage for iPad. Aaaaaalmost where I want it. Written by Glendon Mellow On November 12, 2013 In "ArtRage", "Ent", "iPad"
This is why I bought myself an iPad last week. 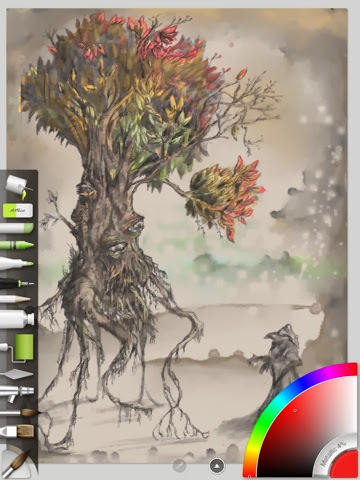 ArtRage is so satisfying. Can't wait to get the Wacom Intuos Creative Stylus to go with it! Written by Glendon Mellow On October 20, 2013 In "ArtRage", "Ent", "iPad", "wip"
Written by Glendon Mellow On August 13, 2013 In "Ent", "Sketch Club", "fanart", "iPhone"
Lately I've been filling my sketchbook with some of my favourite characters from various pop culture franchises in a very fanboy-ish manner. So for the month of August, expect each Art Monday to feature something fun and different from usual Flying Trilobite fare. There are still a number of paintings not under the fanboy umbrella that I aim to crank out this month. Y'see I'm practicing not-sleeping for when I return to school in September. Today, let's begin at the Ent. Pencil in my super-awesome giant Moleskine Folio. I created this piece for Henry Gee and the magazine Mallorn. (I'm hoping it sees publication! Naked desire! There!) Henry was looking for something different than the work of Peter Jackson's films, or D&D derived imagery. 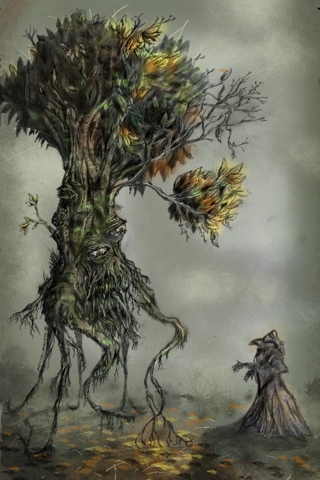 I knew almost right away I wanted to do an Ent walking surrealistically on tiny roots and eyes blinking out of knots. I think it's going to eat the wizard-dude though. Next week: let's bust out some Marvel Comics, shall we? Written by Glendon Mellow On August 3, 2009 In "Artwork Mondays", "Ent", "LOTR", "Moleskine", "fanboy", "fantasy", "sketch", "tree"